Former Singapore Idol co-host and current cupcake magnate Daniel Ong is in a bitter spat with his neighbour that has spilled online and beyond. 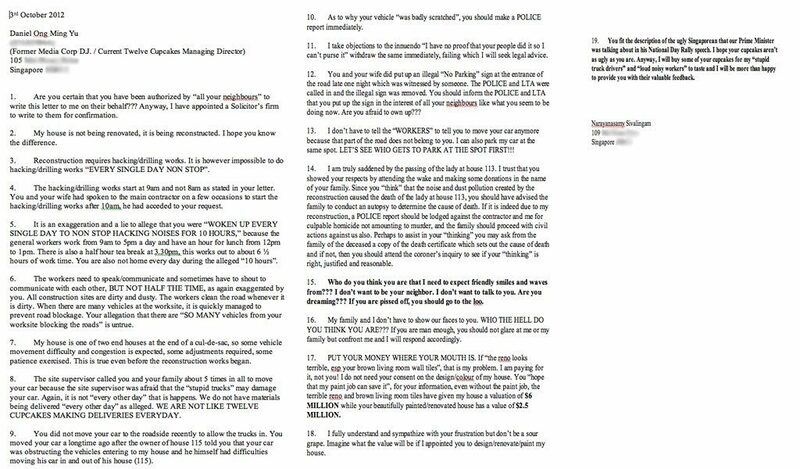 Ex DJ / Current Twelve Cupcakes Managing Director, Daniel Ong's ridiculous letter to my family...I could never imagine him being so childish and nasty with his groundless accusations and personal opinions...check it out! Ex-DJ and Twelve Cupcakes boss Daniel Ong writes angry letter at neighbour doing renovations. 6:36pm: Charlene Sivalingam posted another photo on Facebook, writing: "And so, my dad's reply to him was..."
There are 2 sides to every story. I wish I didn't have to tell you mine. 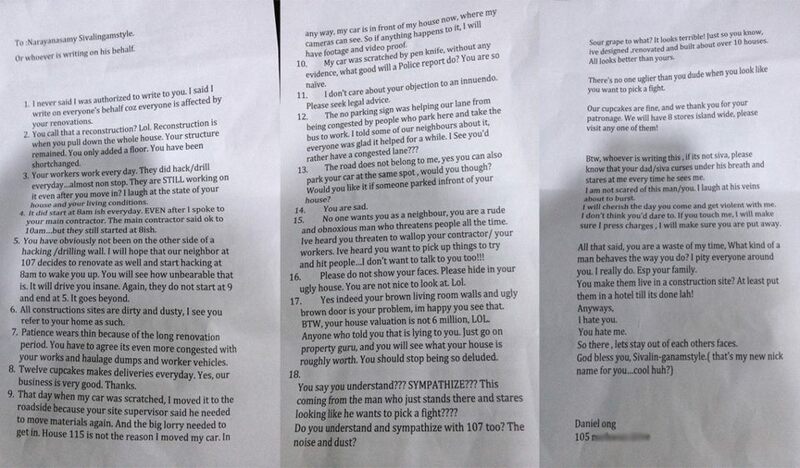 I am not going to share EVERYTHING that transpired to make me write the letter to my neighbor…. But I will share some things to clear the air. And though she started this online campaign toward me, I didn’t want to drag the family through dirt coz of 1 man’s actions. But please know one thing, I am not a person to retaliate…unless provoked. To all our reporter friends, me n Jaime do not wish to add fuel to this mans fire. I’m just trying to set the record straight. We also do not wish for this to go to print. I am writing this now, to state some facts…and to over throw some false accusations hurtled my way. Many people are here to “watch a show” have some “popcorn” as they say coz to them its entertainment. Its not, its my life and I’m living thru it everyday with my unpleasant neighbor. I would like to ask you to hear my side first before you continue insulting me or my business on cyberspace. Yes, I sent him a frustration letter, and he sends 6 nasty reply letters to my whole entire family and business associates. I sent him a reply after. He then tries to get a ST reporter to write about the story, but after talking to both sides…the reporter realizes there is no story. He is trying to blow this up as an act of aggression…he tries to intimidate with legal action… but there is nothing to act on. To summarize everything up, I’ve overheard my neighbor threaten his contractors with violence if they didn’t finish work on time. I’ve heard stories on him refusing compensation for damaging a neighbor’s wall, where water seeped through and damaged a mattress. I’ve heard a scuffle that broke out between him and our neighbor and he picks something up to threaten our neighbor? And his daughter wonders why I don’t speak to him … and only to the nice main contractor about anything? Since my letter, I’ve endured numerous stare downs where he curses me under his breath. He obviously does not want peace, so I stopped trying. He claims I insulted him coz I addressed him as Sivalingam num-style in my last letter…but I told him that I didn’t mean that and it’s the coolest thing around now. We part ways, but I’m glad my friend, his friends and my wife were around to witness that unprovoked lash out at me, and the refusal of peace. Anyhoo, here are the untruths circulating online now. Untruth # 1- After talking to the family, according to the reporter his son says I stared/”shiong” at his him for over a minute as I drove past his car the other day. That’s crazy coz I didn’t even know that that was his son! It was a narrow road, and I was trying not to hit any cars…a man steps out of a parked car , and I glance up to see who it was…and I drive off. I later hear the story about my “Glare off” from the reporter. Amazing. Untruth #2-Also, Charlene Sivalingam claims I came out of our house while she was on her roof and showed her the middle finger the other day, which is weird coz IVE NEVER SEEN HER ON THE FREAKING ROOF!!! Why in the hell would I do that?!?!?! Did I come out of my house and stretch? And in that moment…you deemed I was giving you the finger? OMG??? What?? 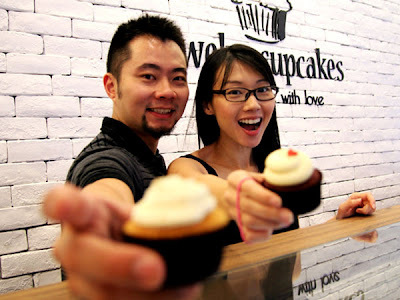 Oh, and Charlene, you coming to my store at Millennia walk the other day to loudly exclaim…”HMPHHH…twelve cupcakes! “And snorting before walking away …What was that about? Is it coz we were sold out? Im sorry if we were. Untruth #3- That this is a publicity stunt for Twelve cupcakes. From the start, they went to the press (with no results) …then they started an online campaign against me, Surely I have to defend myself now. Renovations started in April, and just ended recently… Over 6 months of it. You would go mad too, if you lived through the pounding/drilling and hacking that gets EVEN LOUDER through walls. Sometimes, 3 pile drivers are at work at the same time. Its crazy loud. They use this as a torture technique in some countries. I’ve seen it on TV. It starts at 815am sometimes earlier, even after I spoke to them about starting at 9am multiple times. Amazing thing is they hack from 8-9…then stop for an hour before continuing at 10. I spoke to the main contractor to start at 9 , who said he will change it. It changes for 2 days…and reverts to the 8am schedule. Btw, I have late nights…and only sleep at 2am. In the afternoon, after lunch…same deal…I’ve had to move 2 year old Renee out from home for her afternoon naps coz of the BOOMING noise. You know kids, they need naps or they get real cranky. About the car, I moved my car from the front of my house to the side of the road many times whenever they ask, sometimes ringing our bell at 830am to move, even before I’m awake or dressed. Imagine our frustration! Until one day, after moving it to the side again, my car is scratched with a penknife across BOTH sides. I’ve hence told them I will stop moving my car, coz my cameras cant catch the culprits. Guys, I’ve lived through the dirt, dust and renovations. I Understand that there must be noise in renovations, and I empathized for months…But try it for 6 months… and you might understand why I was frustrated. I know sending the letter might not have been the best way to get through to him…but it sure beats talking to him straight up after hearing over the walls so much about him. I’m sure it would not have ended pretty if I approached him. I especially empathize with his workers and main contractor for what they have gone through, and for some of the family to having moved back even before the total renovations was done. I have no wish for this to blow up, but many have taken to insulting me on cyberspace even before knowing all the facts. I have decided not to publish the letter he sent to me, where he insults me, taunts my car being scratched, and boasts of his house being worth $6 million as compared to my smaller abode. But seriously, you would have a serious chuckle and wonder why such a person exists if you read it. I have no wish for war, or to provoke my neighbor Mr Sivalingam . Who knows what will he do? Like what I told the ST reporter, I will only ignore him from now on, and if he picks a fight again…I will walk away. My mother said to me, “be respectful to the elderly… “ that’s good advice… Pat law says…”only pick on people your size”...that’s great advice too. In short, I just want to live my life…free from an intimidating neighbor, free from people in cyberspace who attack me and my family without knowing the full story, and more importantly… this is exhausting. Im uber thankful to my wife for being my beacon of love, wisdom and understanding through all this. And we are stronger everyday coz of trials like this. I’m also very thankful for everyone who has contributed to twelve cupcakes becoming the #1 cup cakery in Singapore . I would much rather focus my attention on making Singapore proud of another local brand to make it big overseas. I thank you for reading this and would like to offer Mr Siva and his family an offering of peace again. There is no need for War, or hostility guys. Like it or not, even tho we may never interact. It is what it is, we are neighbors. PS: Sorry for the long post and does anyone know of any good car spraying companies? This came the following day after my dad's reply. You can complain about the noise and dust, but not to the extent of insulting the entire family and make a mockery of our family name. This is a waste of time. It really is. Im pretty sure you have more to do in your life. What started as prolonged inconsiderate noisy renovations, with me sending a letter in frustration ,he returning it and then his family spreading their side of the story online and to reporters, and me saying my side of it has gotten us here. So what has changed? Nothing! 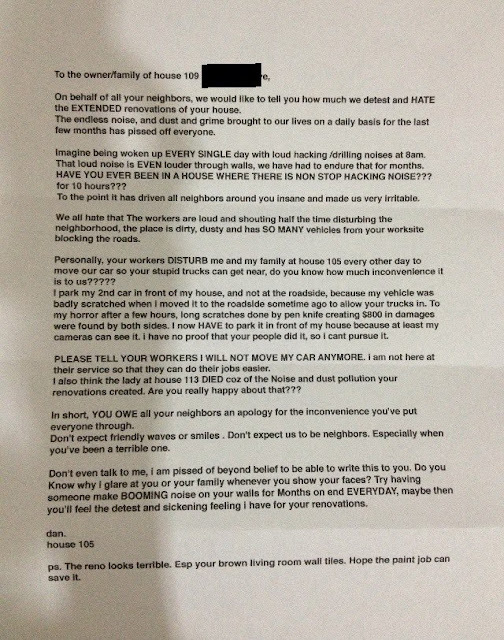 Yes, i wrote my inconsiderate arrogant neighbor a nasty letter in duress, and yes he is a nasty neighbor back...daily. And I wont press charges against him for vulgarities and threatening me with violence. So that's that. We all live with it. The family wants 15 mins of fame, so thats why they are pushing it to the papers and police and anyone who would listen. But the truth is, its 2 neighbors angry at each other! Thats it! To All the reporters trying to get a story, and TNP coming to my house waking my child at 940pm is not cool. Both me n jaime will decline to give any more comments to anyone coz there really is nothing more to say! To people hiding behind computer screens , saying mean things. Your words don't even deserve any response from me. I've said my piece, and thats that. Most everything that has happened was in my last post. Life goes on. Lets try not to waste another second. 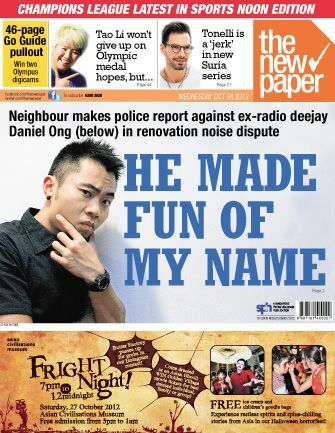 A dispute between neighbours over renovation noise led to one of them making a police report against the other, claiming that the latter had made fun of his name. The other party in the dispute is former radio deejay Daniel Ong, 36, who is now known as a celebrity cupcake-shop owner with his wife, Miss Singapore-Universe 2001 Jaime Teo. Mr Sivalingam showed TNP a letter purportedly written by Mr Ong to him, in which Mr Ong allegedly made fun of his name. He also said that Mr Sivalingam had written “six nasty reply letters” to him and his business associates. When asked about this, Mr Sivalingam confirmed he had sent the letters, but only to defend himself against Mr Ong’s accusations. It all started with a dispute over the noise and dust caused by reconstruction works at Mr Sivalingam’s double-storey corner terrace house at Mei Hwan Drive, near Serangoon Gardens. Mr Sivalingam, who declined to give his occupation, has lived there for 26 years while the Ongs moved into their house, two units away, about two years ago. He decided to make some major changes, such as building an additional half level, to his house this year. Work began in late April. About two to three months later, Mr Ong complained to Mr Jeffrey Lee, the main contractor from Imperial Engineering, which is handling the renovation, about the noise. He asked that they start work after 10am instead of 9am. Mr Lee, 54, said their exchange was amicable and they tried to accede to Mr Ong’s request. But things turned sour late last month when Mr Ong sent his first letter to Mr Sivalingam, stating his frustration with the noise from the works. Mr Sivalingam made the police report after receiving a second letter from Mr Ong on Oct 7. The dispute then became a talking point online after Mr Ong’s first letter was circulated on the Internet on Oct 20. Mr Ong also commented on the dispute on his Facebook page. According to his Facebook post, the drilling and hacking starts every morning at 8.15am and sometimes earlier. “You would go mad too, if you lived through the pounding/drilling and hacking that gets EVEN LOUDER through walls. Sometimes, 3 piledrivers are at work at the same time. It’s crazy loud,” he wrote. Mr Lee said: “They approached us a few times, saying that it’s too noisy and asked if we could start later. But he conceded that the workers sometimes arrived earlier than 9am. “Their carrying things into the house may have unintentionally created some noise,” he said. Besides the noise, Mr Ong also took offence at the fact that he had to move his second car, which he parks in front of his house, to the end of the road to allow the contractor’s lorries to drive in. “I moved my car from the front of my house to the side of the road many times whenever they ask, sometimes ringing our bell at 8.30am to move, even before I’m awake or dressed. Imagine our frustration!” Mr Ong wrote on Facebook. On one occasion, after moving his car, he said he found scratches on both its sides. Since then, he has stopped acceding to the contractor’s request to move his car. Mr Sivalingam conceded that his reconstruction works have caused inconvenience to his neighbours. “There is some merit to (Mr Ong’s) complaints. I have no doubts about that. But it is exaggerated,” he told TNP. He pointed out a complaint in Mr Ong’s first letter, where Mr Ong said the hacking had gone on for 10 hours. “If the hacking had gone on for so long, the workers would have been sent to the hospital for broken limbs,” he said. He went on to add that it could get “a little too loud” when there were three people hacking at the same time. “But we have a noise meter present, and it doesn’t show that we have exceeded the noise levels,” said Mr Sivalingam. Mr Lee, the main contractor, confirmed this. In Mr Ong’s first letter, he also claimed that an elderly woman who lived in a nearby unit might have died because of the noise and dust caused by the renovations. But Shin Min Daily News quoted the woman’s son as saying that she was in her 70s and had died because of an illness. So what do other neighbours think of the dispute happening right in their backyard? 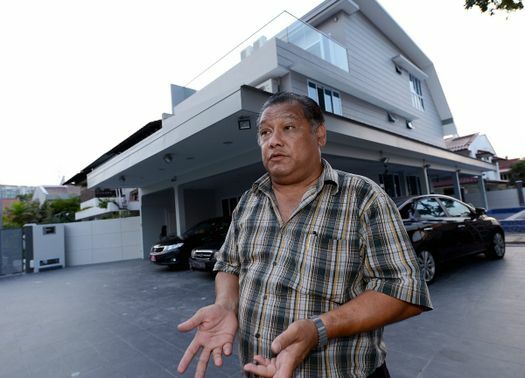 The residents living in the house between Mr Sivalingam’s and Mr Ong’s declined to comment, except to say that they wished to stay out of the dispute. The daughter of a neighbour who lives opposite Mr Sivalingam, said she was unhappy with the fact that Mr Ong, in his letter, had spoken on behalf of the other residents at Mei Hwan Drive. Although she does not live at Mei Hwan Drive, she visits her father at the house every day. “Sometimes, on weekends, my children and my brother’s children will play on the main road. When (Mr Ong) comes home and gets out of the car, he doesn’t even bother to acknowledge us or to say hi,” said the woman, who declined to be named. She said that while the renovation works were noisy, “it’s a give-and-take situation between neighbours”. She added that she once complained to Mr Sivalingam about the dust generated by the works, and the workers rectified the situation. At the end of the day, Mr Sivalingam is upset because the dispute has degenerated to a personal level. “If they say it gets noisy because of the drilling, I agree. The site could have been managed better. “But what did I do wrong? To beautify my house, that is wrong?” asked Mr Sivalingam. “So you change my name? That is a joke?” he added. When TNP visited the Ongs’ residence on Monday, Ms Teo declined to comment. Mr Ong also posted on Facebook yesterday that both he and his wife would no longer comment on the issue. The Siva family is bent on milking this for every drop, trying to get as many people as possible to cover this. Even appearing with a “ke lian” photo…Trust me , he doesn’t look like that when he’s staring me down or picking a fight in person. Siva says I was racially discriminating and insulted his culture. That’s insane, I gave him a nickname. That’s it. Sivalinganamstyle (the hottest dance on the planet). It’s a cool cute nickname! Since when did I become the register of name changing? This nickname is in reference to his stance when he is threatening people…with his hands on his hips. And some of my best friends are both indian and malay. I hosted NDP…I love my multi racial country! Oh well, Armed with that only, he makes a police report. A nice police officer visits me and tells me, there is no such classification in law. And he is just following up. I DO learn from our friendly officer tho that Siva has done things that have a classification. Siva used vulgar language on me-that’s under “ Intentional harassment”. Siva also wanted to get violent with me. Wanting to fight- that’s under “Verbal threat” and lucky he didn’t swing anything at me…coz that’s under “criminal intimidation” and that’s an arrestable offence. Am I going to press charges? Or make a police report? Nah…I respect the time of our police force too much to waste any effort from them on something like this. That said, I hope for everyone’s sake…they have had enough of the limelight and can move on. If you’re reading this, like my last post…I do hope it’s the last I write about this silly time wasting episode. Someone should write a ch 8 drama on this man…and someone should document the drama that my life has … I think I have enough to fill a book. COLUMN: Daniel Ong: I hosted NDP... I love my multi-racial country!